Summary: So begins the Time Traveller’s astonishing firsthand account of his journey 800,000 years beyond his own era—and the story that launched H.G. Wells’s successful career and earned him the reputation as the father of science fiction. With a speculative leap that still fires the imagination, Wells sends his brave explorer to face a future burdened with our greatest hopes…and our darkest fears. A pull of the Time Machine’s lever propels him to the age of a slowly dying Earth. There he discovers two bizarre races—the ethereal Eloi and the subterranean Morlocks—who not only symbolize the duality of human nature, but offer a terrifying portrait of the men of tomorrow as well. Published in 1895, this masterpiece of invention captivated readers on the threshold of a new century. Thanks to Wells’s expert storytelling and provocative insight, The Time Machine will continue to enthrall readers for generations to come. I hated this book. I feel terrible saying that I hate it because it’s a classic, but I couldn’t stand it. It’s a small book, but I had a hard time finishing it. The main character, simply known as the Time Traveler, is a horrible person who embodies the white man superiority that was very much present when the book was written. He doesn’t really care that the Eloi, the futuristic humanoids, are the food of the monstrous Morlocks, and wants to take the Eloi Weena back to his own time, but he had no intentions to treat her as an equal; she would be more like a pet or a wonder for the people of his time to marvel over. He then lets her die in a fire. The main character had no redeeming qualities whatsoever. 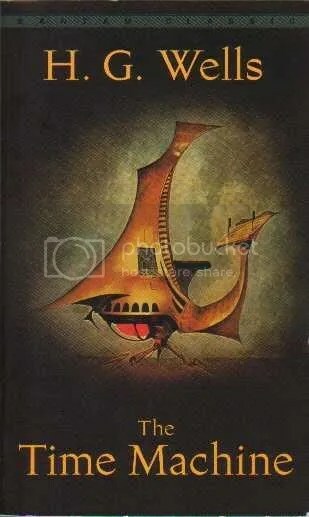 This entry was posted in Personal, Reviews and tagged Book Blog, Book Reviews, Dreaming With Ink, HG Wells, Michelle’s Paper Garden, science fiction, The Time Machine by dreamingwithink. Bookmark the permalink.